Roberto Mancini was born on 27 November 1964 in the small town of Lesi, in the Marche region of central Italy. Like most Italians, he was raised a Roman Catholic and his life revolved around religion and football, passions which remain today. As a player Mancini was best known for his time at Sampdoria, where he played more than 550 matches and helped them win the Serie A title along with four Coppa Italia trophies and the European Cup Winners’ Cup. Towards the end of his playing career, he showed signs that he would end up in management when he started giving team talks at half-time. Coach, Sven Goran Eriksson, was a huge influence on ‘Mancio’, playing under him at both Samp and Lazio and he became the Swedes assistant at theBiancocelesti near the end of his playing career. Mancio joined Leicester City on loan in January 2001, but by early February he was given leave of absence, citing personal reasons. He telephoned the club and informed them he would not be returning to England as he had been offered the head coach position at Fiorentina. Despite his brief stay in the Premier League he cites his time at Leicester City as the period during which he fell in love with the English game, and which later prompted him to accept the job at Manchester City. Sadly for Mancini, he never truly replicated his club form at international level and he struggled to cement a regular starting spot for the Azzurri. He won 36 caps for his country, but only scored four goals in return. He made his senior international debut in 1984 against Canada and he would continue to represent Italy for ten years. 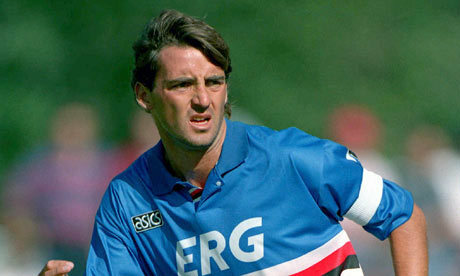 Despite being an influential figure for Samp at the time, Mancini was a non-playing member of the Azzurri squad at Italia 90, kept out of the side by the striking prowess of his Blucerchiatistrike partner, Gianluca Vialli, as well as Salvatore Schillaci and new kid on the block Roberto Baggio. 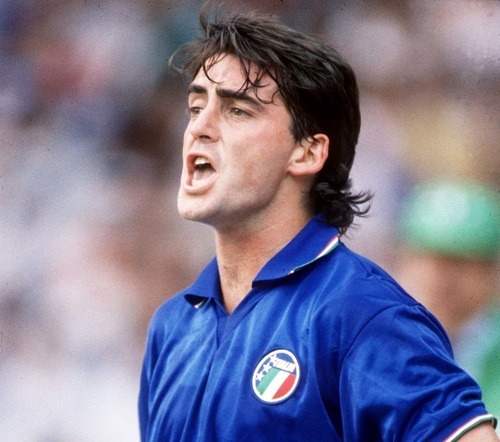 Mancini’s international career ended after a dispute with national team coach Arrigo Sacchi, his assertive personality leading him to become frustrated with not being guaranteed a first team place at the 1994 World Cup. In truth it was a similar story to Italia ’90’ for the assertive Italian, the fierce competition for places hindering his opportunities with players like Gianfranco Zola, Giuseppe Signori, Roberto Baggio and later Francesco Totti and Alessandro Del Piero hastening his self-imposed exile from the Azzurri. 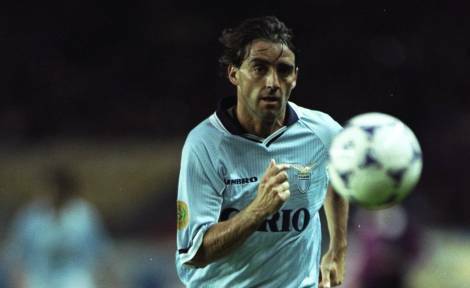 An elegant and skilful player, Mancini was also renowned for his flair, outstanding technique, ball control, and dribbling ability, as well as his tactical intelligence. He frequently stood out because of these attributes. But he wasn’t just a talented forward; he also possessed impressive leadership skills. Mancini’s first head coaching role was at Fiorentina, aged only 35-years-old. Despite his inexperience he won the Coppa Italia with the Viola but left soon afterwards with the club facing bankruptcy. He took over as head coach at Lazio, where again he inherited financial constraints and was forced to lose a number of key players. Despite limited resources during his two season tenure, he still managed to guide the club to Coppa Italia success, a competition of which he was quickly growing fond. 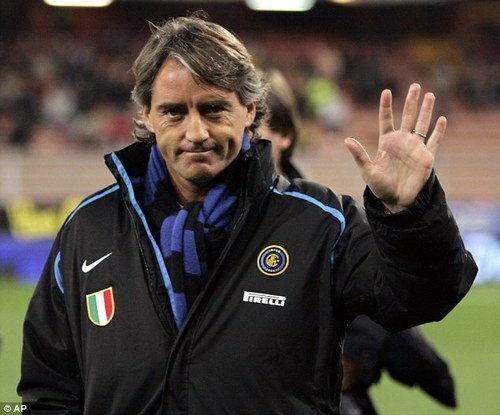 In 2004, Mancini was given the chance to manage Inter, a major club with no shortage in financial resources. During his first spell at the Nerazzurri, the club won three consecutive Serie A titles. It was a record that meant Mancini became Inter’s most successful coach in 30 years. Mancini left the Benemata in 2008, replaced by Jose Mourinho as the Inter board continued their chase of the Holy Grail – the Champions League. After taking a year out of football, Mancini was appointed as Manchester City manager in December 2009. He quickly instilled a winning culture and guided the club to Champions League football and the FA Cup in his first full season in charge. The following campaign he led City to their first league title in 44 years, a success secured in one of the most dramatic final days in Premier League history, Mancini’s men scoring two goals in injury time to complete an enthralling 3-2 comeback against Queens Park Rangers. Credit for this victory, however, is apparently due to divine intervention. As the season was reaching a tense finish, Mancini took time out to visit the religious pilgrimage site, Medjugorie, in Bosnia Herzegovina. ‘Mancio’ stated that it was this pilgrimage that turned the title in his favour. The following season was turbulent for the former Samp man, as City failed to retain the title, losing out to rivals Manchester United, and also losing the FA Cup final to Wigan Athletic. He was sacked the following week however the man showed his class after paying for a full-page advert spread in the Manchester Evening News to say farewell and to thank the club’s fans. The act was reciprocated in the Gazzetta dello Sport by Manchester City supporters. In September 2013, Mancini signed a three-year contract with Galatasaray taking over from the previous coach Fatih Terim. However, the stylish coach barely lasted a year in Turkey despite winning the Turkish Cup. Mancini returned to Inter for a second spell in November 2014, replacing Walter Mazzarri at the helm and it seems he is slowly turning the Nerazzuri’sfortunes around. Mancini has won a total of 25 trophies; 13 as a player and 12 as a coach. Incredibly, every season he has coached between 2002 and 2013, the Italian has reached a semi-final of a major cup competition. He holds a number of records including reaching the most consecutive Coppa Italia finals from 2004 to 2008, the first with Lazio and the rest with Inter.